There are few things more exciting for parents than sitting and listening to their child read. Solid reading skills are vital for academic success so teaching children to read well is essential. 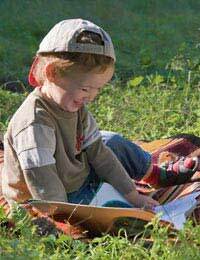 Learning to read is a gradual process that starts long before a child is able to pick up a book and understand the words. Pre-reading skills pave the way for further advancements in literacy, with parents being their children's very first reading teachers. Parents who enjoy reading and who take the time to read to their children are doing much more than proving their kids with pleasant bedtime routines. They are building a foundation for future reading skills that the little ones will need to master. Reading to babies helps to associate reading with comfort and pleasure, and continuing to read to children as they grow establishes a reading habit that can help children to become voracious readers themselves. There are other things that parents can do to help their children to develop the skills needed to be good readers, some of which may seem unrelated to reading itself, but that help to establish thinking patterns beneficial to reading. Making patterns with blocks, beads, or other objects helps kids to develop an understanding of order and sequence, vital to know since letters must be placed in a certain order to form words, and words to form logical sentences. Playing simple word games such as looking for rhyming words or opposites not only helps kids to build their vocabularies, but enhances their thinking skills in terms of how words relate to one another. Discussing stories that are read aloud by parents and other carers helps kids to realise that the words on the pages of books are more than random printing, and helps kids to see that pages are read from left to right, top to bottom, and front to back. Discussing how letters sound is an important activity that parents can do to help their children get ready to read. A child with a sound understanding of phonics will be able to "sound out" unfamiliar words. Encouraging kids to "read" their favourite memorised books to other family members (even to their pets!) helps kids to enjoy reading and builds confidence in their ability to make their way successfully through books. As children show an interest in learning to read, parents and teachers should continue to provide a variety of reading materials, encourage interactive reading in which an adult and a child take turns reading a book together, and offer lots of opportunities to play games with words. Simple books that combine a few sentences with clear illustrations are best choices in the beginning, allowing parents to encourage their budding readers to help them to tell the stories. Parents can read most of the page and ask their child to complete the sentences, allowing them to make assumptions on what is written by looking at the pictures. Correct answers should be praised and words on the pages should be touched and sounded out together, at least some of the time. Having fun with words is important, so kids should be encouraged to make up silly stories and find rhymes for words that may not be easily rhymed, even if that means "inventing" their own words (apple/bapple, purple/sherple, pizza, meatsa). Parents can look for everyday opportunities to start word games, which can help to pass time when running errands, taking a bath, or making meals. Once kids have begun to read, many parents discontinue reading aloud to their children. While it is important to allow time for children to read independently, continuing to read as a family is beneficial, too. Not only is family story time a good bonding experience for parents and children, but children often enjoy listening to books that may still be a difficult for them to read on their own. In addition to the pleasure that comes from reading together, many parents find that story lines in books offer a multitude of opportunities for then to open up discussions with their kids about a variety of topics, allowing them to keep the lines of communication open between them and their growing children.